The purpose of this CCNP GNS3 lab is to gain a better understand of how to configure EIGRP on Cisco IOS routers in multiple autonomous system. 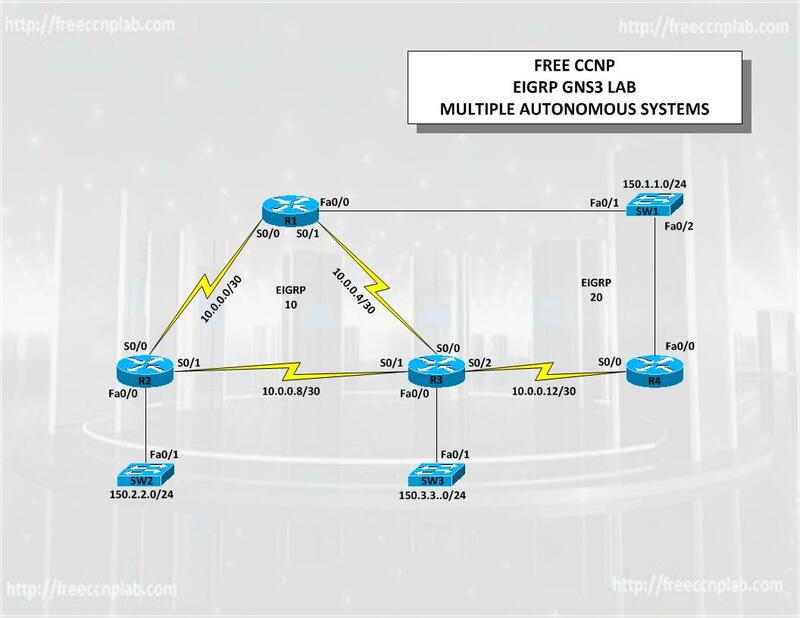 In this lab we will use GNS3 to model a simple lab to demonstrate how to configure and verify EIGRP in a multiple autonomous system implementation. Additionally we will learn path control and route summarization. Each EIGRP process is identified by an autonomous system (AS) number, just like IGRP processes. Routers with the same AS numbers will exchange routing information with each other, resulting in a routing domain. Routers with dissimilar AS numbers will not exchange any routing information by default. However, routes from one routing domain can be leaked into another domain through the redistribution commands. The default behavior of EIGRP is to summarize on network-number boundaries. This is similar to RIP and IGRP and is a prudent way for a routing protocol to reduce the number of routes that are propagated between routers. Equal cost path – Applicable when different paths to a destination network report the same routing metric value. The maximum-paths command determines the maximum number of routes that the routing protocol can use. Unequal cost path – Applicable when different paths to a destination network report are of different routing metric values. The variance command determines which of these routes is used by the router. Every routing protocol supports equal cost path load balancing. In addition, EIGRP also support unequal cost path load balancing. Use the variance n command in order to instruct the router to include routes with a metric of less than n times the minimum metric route for that destination. The variable n can take a value between 1 and 128. The default is 1, which means equal cost load balancing. Traffic is also distributed among the links with unequal costs, proportionately, with respect to the metric. thanks for this webite, it’s really useful for me. however, the topology on the beginning of your every post is too small. would you please be so kind to make it larger, at least 50% larger than your original post? If you download the free lab you will find a larger topology inside. This Lab is for BGP not for EIGRP. Diagram included does not match the page sadly.